Last week, Sage and I headed to Twelve Eighty once again to meet up with members of the Atlanta Food Bloggers’ Society. This time, to try items from their new menu as well as to meet their new Chef de Cuisine, Andreas Z. Georgakopoulos. On our last visit, we previewed their delicious spring menu. If you haven’t made it Twelve Eighty by now, this menu is definitely worth the visit. Each dish was carefully seasoned and prepared with the customer in mind. We started the preview with a Roasted Beet Panzanella Salad. 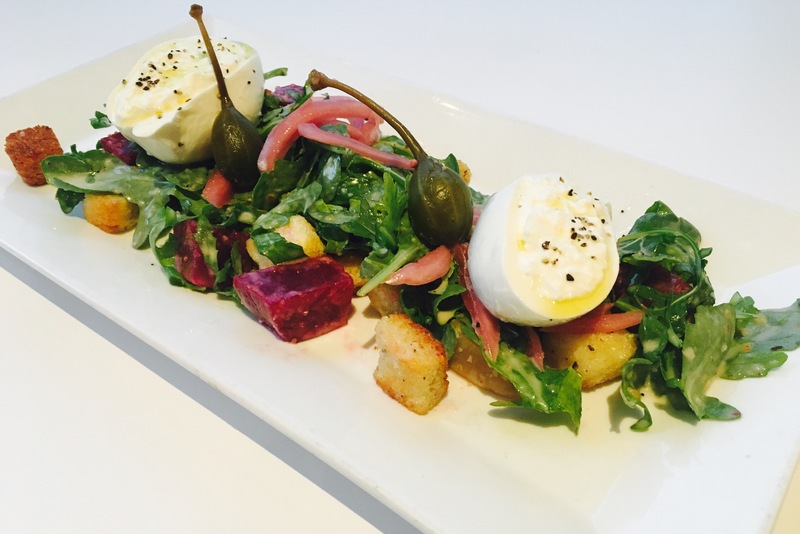 The salad consisted of red & golden beets, brioche toast, crushed Burrata , sweet onion, baby arugula, caper berry, and lemon thyme. I absolutely loved this salad! Every part of it! Even the beets! I have not a major fan of beets, but I’m getting there. The Burrata was amazing. Next up was the Ahi Poke Tuna. 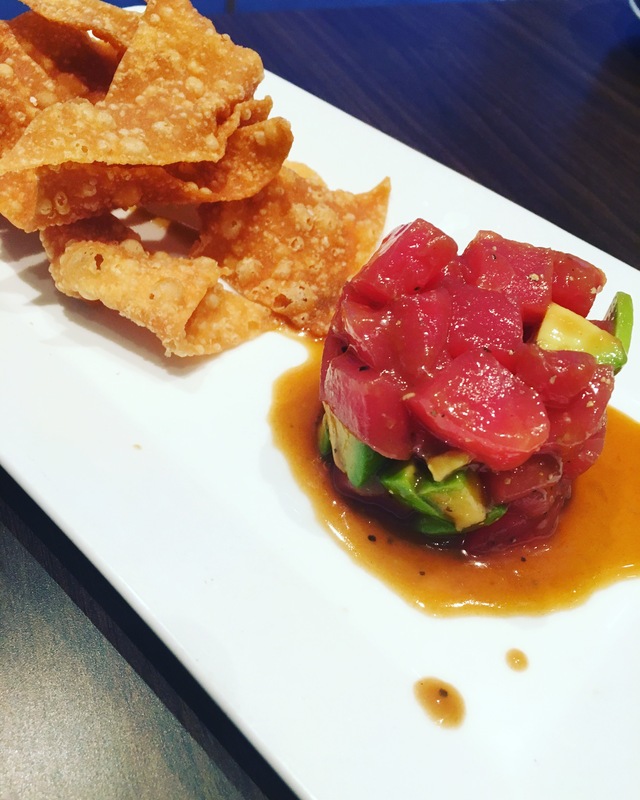 It was presented Hawaiian style with Advocado, Teriyaki and Crispy Wontons. It was very tasty. Then out came the “Orchestrated” Fried Green Tomato Napolean. Yesss! First, let’s just start with the presentation. Beautiful! It was deliciously stacked with Seared Old Bay Shrimp and perfectly breaded fried green tomatoes. Then topped with Goat Cheese crumble and spicy pickled remoulade. Oh yeah! I can’t wait to go back for this! It was simply delicious. Next, we had the Pastrami Spring Rolls. These rolls were stuffed with house-cured pastrami, Swiss cheese, oyster mushrooms, and pickled red cabbage claw. Really nice flavors. Next up! 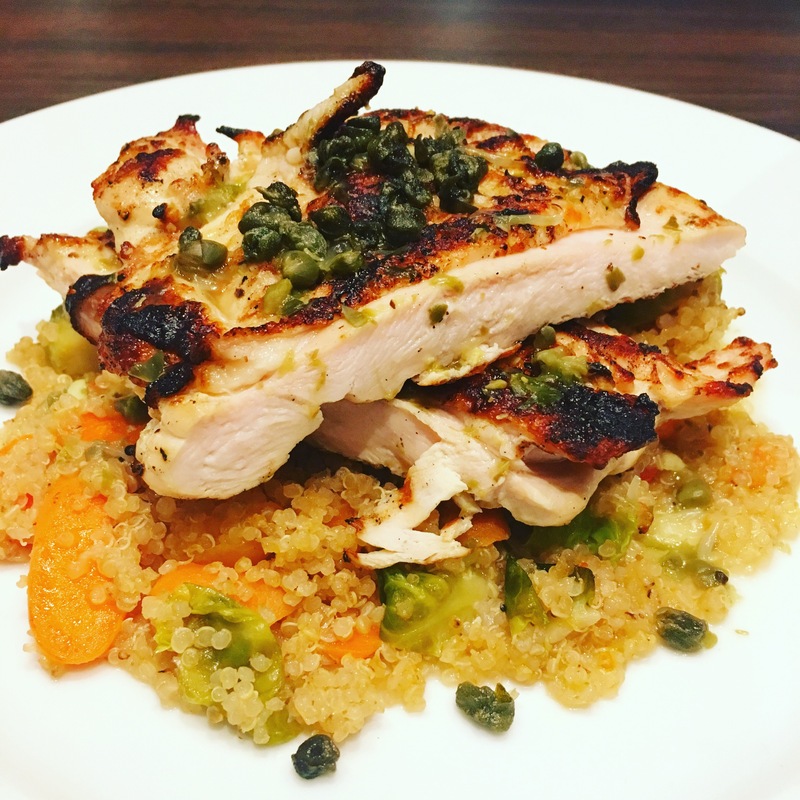 Grilled Chicken Paillard with Sautéed Quinoa Pikaf with Seared Brussel Sprouts, Baby Carrots, Shaved Asparagus, Grape Tomato, and Caper Piccata. I loved the combination of the flavors. A really great dish. We also tried some of their crafted cocktails available at their full bar. They were all tasty. I recommend all of them. My favorite was the Twelve Eighty Cocktail. 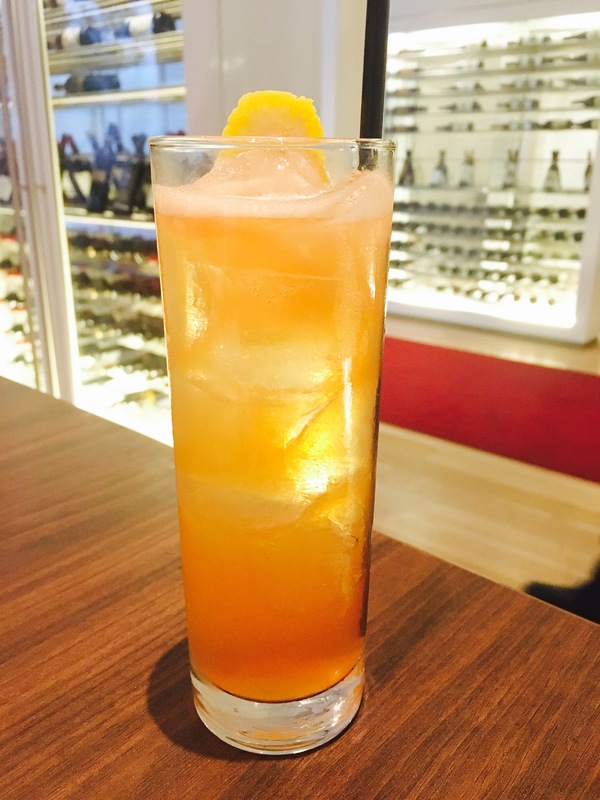 It was made with Old Fourth Ward Vodka, St. Germaine, Aperol, Lemon, Orange Bitters, and a splash of Soda. It’s an all-around great cocktail. Now for dessert!! Their pastry chef, Chef Derrell Lawery, is so awesome! The desserts were so scrumptious. 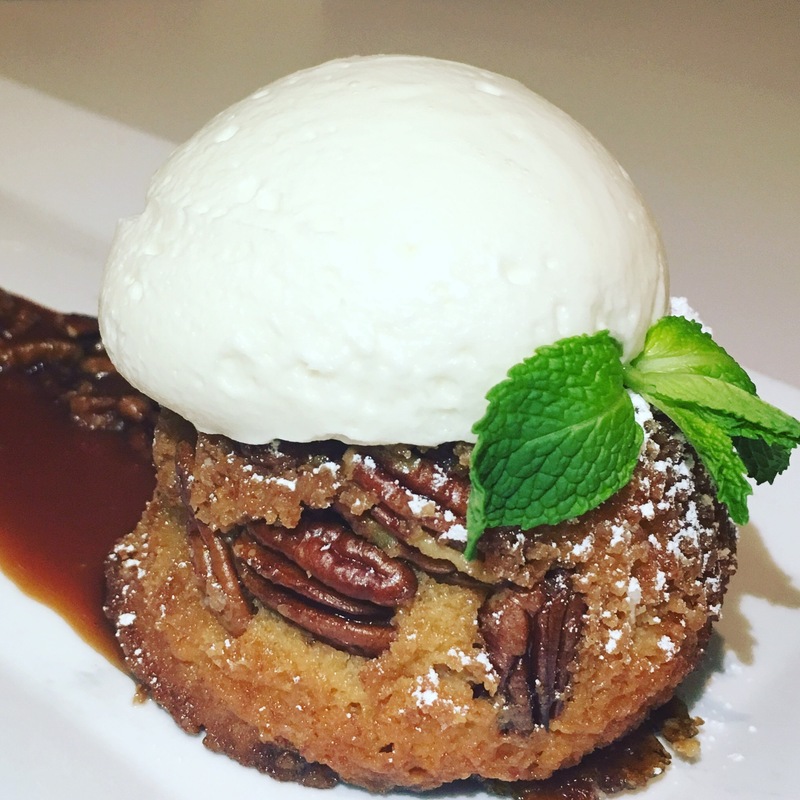 My favorite was the Warm Butter Pecan Rum Cake. Yummy!! It was topped with some fresh whipped cream to make it even more delicious. Just look at it!! As you can see, the menu preview was amazing. As always the staff was more than accommodating. 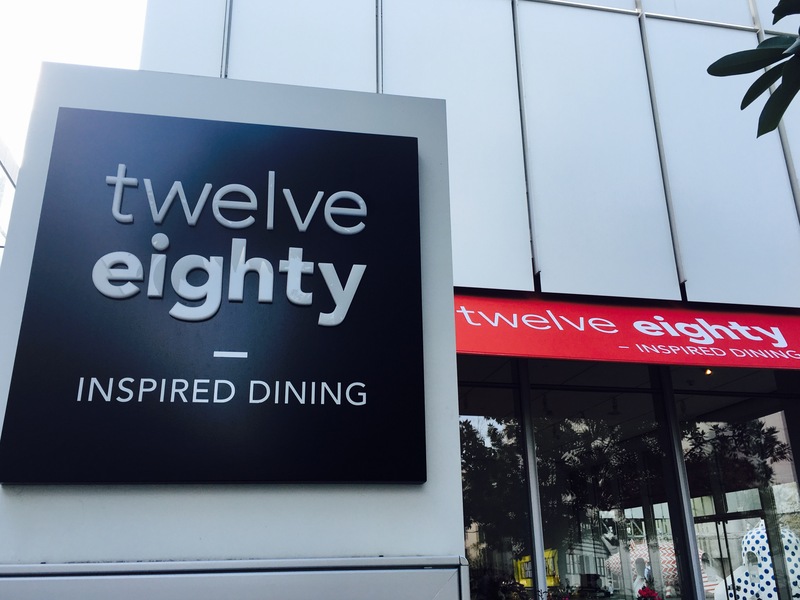 Be sure to visit Twelve Eighty on your next night on the town. *I received this dinner complimentary. All thoughts and opinions are my own.